Doctor Who finale The Name of the Doctor spoiled by early DVD delivery. The finale gets spoiled – thanks to the BBC mail order service’s screw-up. This Saturday at 8:00 p.m., BBC America will air the finale of Doctor Who Season 7 Part 2. 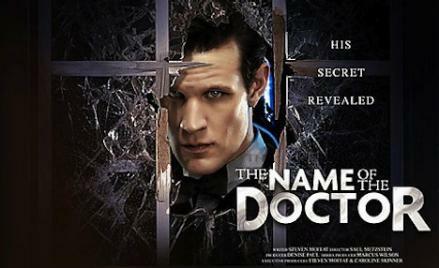 The Who producing team is definitely selling the episode, tantalizingly titled “The Name of the Doctor,” on the strength of its stunning plot revelations. Star Matt Smith says it’s a “complete game changer.” Showrunner Steven Moffat promises “surprises and questions that have never been revealed in the history of Who, including the Doctor’s greatest secret.”* But while we and a whole galaxy of Who-lovers are scrutinizing the hints, spinning out crazy theories, and counting the seconds until Saturday, a handful of lucky fans already know—thanks to a surprising screw-up by the BBC’s mail-order service. After a number of fans on social media delightedly reported receiving their pre-ordered DVDs of the entire season this weekend, BBC Worldwide acknowledged that, due to a shipping error, a “small number” of these DVDs were sent out three weeks early. The BBC and BBC America have gone into full damage-control mode, imploring fans with early DVDs not to post spoilers and even going so far as to promise a “special video” featuring Smith and previous Doctor David Tennant if fans can keep the finale’s secrets off the Internet. So the BBC’s panic/bribery response to the premature exposure of “The Name of the Doctor”—close on the heels of 50th Anniversary guest star John Hurt maybe saying way too much in (and seriously don’t click this unless you want to see a possibly HUGE SPOILER) an interview with the Eastern Telegraph – seems to signal that Moffat has some pretty huge surprises coming our way. So if you’re a Doctor Who fan who hates getting spoiled? Stay off social media for the next six days. Somewhere in the world, there’s a fan who got that DVD who is not going to be able to resist. (Here, I’ll help: The only important thing on social media in the next week is this photo of Ryan Gosling directing Matt Smith on the set of the currently shooting film How to Catch a Monster. * Notice anything a little different about Smith? Can he really grow his signature 11th Doctor Hair back in time for the annual Doctor Who Christmas special, which typically shoots in late summer? I’m betting not. So either Smith isn’t in the Christmas special, replaced by a new Doctor – or else a heated competition is going on right now between the greatest wigmakers of London. So—having not yet watched an advance copy of “The Name of the Doctor” (and not even knowing as yet if one will be made available)—I’m going to make my prediction: Clara is the Doctor from the future. We’re getting a surprise regeneration this weekend. Count on it. You can check back here this weekend for either my groveling admission that I was wrong, or—much more likely—my vindication! Correction, May 13, 2013: This article initially misquoted Steven Moffat as promising “surprises and secrets,” not “surprises and questions.” It also misstated the title of Ryan Gosling’s upcoming movie—it is How to Catch a Monster, not How to Make a Monster.